Poseidon's trident was stolen and you've been given the task of returning it to his temple. Unfortunately it's one of those temples that doesn't really want any visitors at all (even if you do have good intentions), and will start to flood if you take a wrong step. 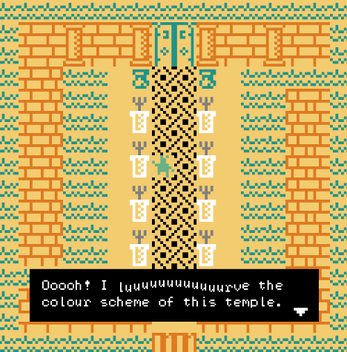 Get to the door of the inner chamber without flooding the temple in this short Bitsy game.... but you've got to get past the hippocampus first. Use the arrow keys to move, & to move the dialogue on. Originally made for Ludum Dare (August 2018). oh thats a good puzzle!